Sir John Tomlinson in make-up, right; model of Sir John’s head, left: Royal Opera House, Covent Garden. Photos © David Secombe, 1994. Sir Harrison Birtwistle’s 1990s opera Gawain derives from the Middle English romance Sir Gawain and The Green Knight, in which the titular hero avenges the honour of King Arthur by decapitating the mysterious Green Knight who has appeared at court and insulted the King. This being a medieval romance, the Green Knight picks up his severed head and invites Gawain to a return match one year hence. The Royal Opera House commissioned the opera from Birtwistle, with a libretto by David Harsent. The commission was an ideal match of subject and composer, given Birtwistle’s fondness for using mythic narratives as a foil for his austere, modernist style. 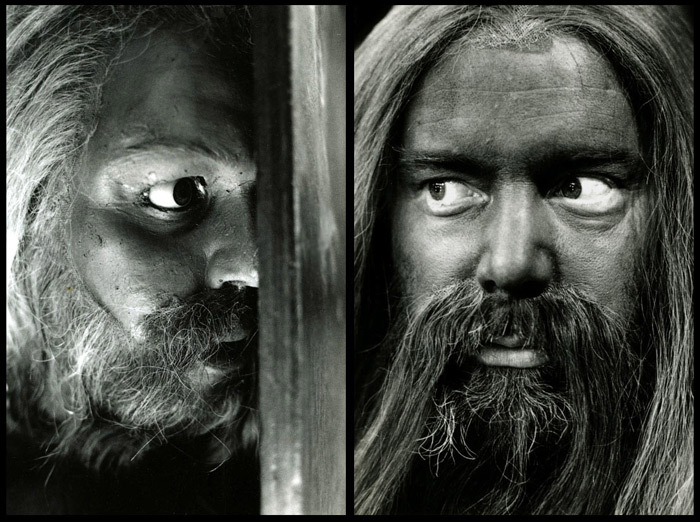 In the photograph above right, the great Wagnerian bass John Tomlinson (now Sir John Tomlinson) sits in make-up, having just been transformed into the Green Knight. To facilitate his onstage decapitation, a model of Sir John’s head was made (above left, nestling in its box) commissioned from television’s Spitting Image puppet-making team. The 1994 revival of Gawain at the Royal Opera House was booed by a group of musicians opposed to all post-romantic developments in classical music; they called themselves ‘The Hecklers’ and went to the opera for the purpose of abusing the work and its composer. Naturally, the publicity drew more attention to the opera and Birtwistle himself, as did the programming of his characteristically uncompromising saxophone concerto Panic at 1995’s Last Night of the Proms. Birtwistle’s music reminds this listener of the best 1960s Brutalist architecture: short on charm, but supremely confident in its structural integrity and expression of purpose. That said, my own attendance at the opera lasted about fifteen minutes, after which I went to the crush bar in search of a gin and tonic. D.S.